A reader of the old Hebrewroot page expressed concern about losing an article that I wrote back in the day called, well, “Messiah in Genesis.” In the interest of preserving my old work (even if it looks more like a few notes than a finished article), I’m reposting it here. Obviously, it crosses over significantly with Ben Joseph and His Brothers and Messiah, Son of Joseph, but there are a few details here that I’m not sure are already on the blog. Luke 24:27 – Beginning from Moses and from all the prophets, He explained to them in all the Scriptures the things concerning Himself. Luke 24:44-45 – [Yeshua] said to them, “This is what I told you, while I was still with you, that all things which are written in the Torah of Moses, the Prophets, and the Psalms, concerning me must be fulfilled.” Then He opened their minds, that they might understand the Scriptures. Genesis 49:10 – Judah’s rule and tribal identity will not pass away until Shiloh comes. 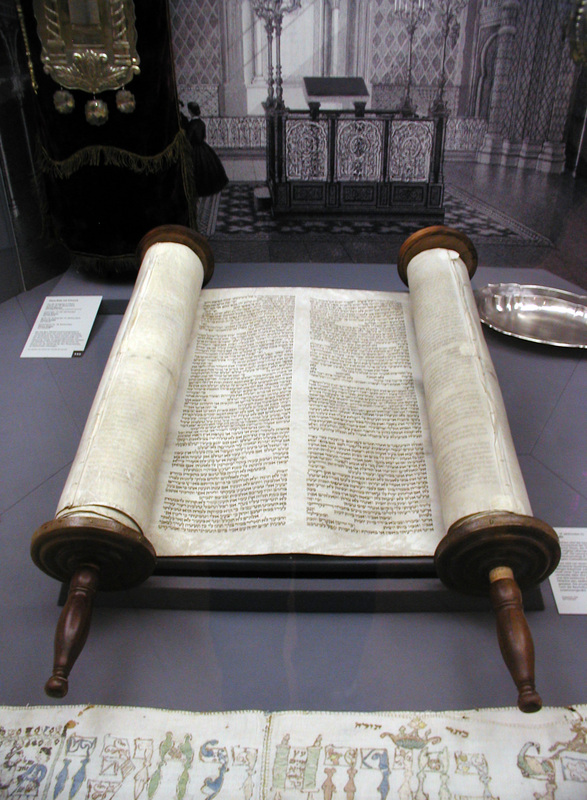 The pattern of history is revealed in the Torah. See The Way of Paradise for more information. o Yeshua also sacrificed on Mt. Moriah, possibly on the same spot. o He did not resist, but submitted to his father’s will – “Nevertheless, not My will, but Yours be done” (Luke 22:42). Gen 22:19 – So Abraham returned to his young men, and they rose up and went together to Beersheba. Abraham lived at Beersheba. o Yeshua will only reappear when the Holy Spirit brings Him a Bride from among all the nations (Mat. 24:14, Rev. 7:1-7). o Isa 11:1 – A shoot will come out of the stock of Jesse, and a branch out of his roots will bear fruit. Jacob lives among the Gentiles, where his father-in-law Laban tries to cheat him by changing the terms of his wages ten times, but he nevertheless prospers. Finally, Jacob leaves to escape Laban’s anger. o The Jews were forbidden to own land in much of Europe, so they cultivated the intellect, becoming doctors and lawyers and loaning money to Europe’s rulers—only to be kicked out of every land where they went whenever the local rulers owed them too much. o The Jews have returned to the Land, but live in fear of the Gentiles around them. When his brother comes up against him in an armed company, Jacob first sends gifts to placate him, divides his people so that at least some will escape, and then spends the night wrestling with God, dislocating his hip. God changes his name to Israel (“Prince of God” and “Wrestles with God”). o The Jews are seeing the Gentiles coming against them. Hos 12:-4 – In the womb he took his brother by the heel; and in his manhood he contended with God. Indeed, he struggled with the angel, and prevailed; he wept, and made supplication to him. He found him at Bethel, and there he spoke with us. o The day is coming when they will seize Him and refuse to let go until He blesses them, and on that they, the Jews will truly become Israel. Joseph is so much a picture of the Messiah that the Talmud twice refers to a Mashiach ben Yoseph, a suffering servant who would die for the sake of the nation and who would appear either just before or alongside the Mashiach ben David, the conquering King. We know from the Dead Sea Scrolls that there were several theories in the 1st Century that there would be more than one Anointed; it seems quite possible that the Mashiach ben Yoseph idea was around in Yeshua’s time, perhaps being referenced in Luke 3:23, which states that Yeshua was “being (as was supposed) the son of Joseph”–a bit of a pun engaged by the good Doctor. Joseph’s first parallel to the Messiah is in his relationship to Isaac: Isaac, another type of Messiah, was born before Jacob/Israel and indeed gave birth to him, and Joseph was born to Jacob in turn. This prefigures that Yeshua would be both the Root and the Branch of David (Isa. 11:1, 10; Rev. 22:16). Secondly, as did many other figures in Israel’s history, both Isaac and Joseph were the products of a miraculous conception, a barren womb being opened. The Holy One one-upped that miracle with the Virgin Birth. Joseph’s next parallel to Yeshua is in the relationship with his brothers. Why did Joseph’s brothers hate him? Because he was the favored son of Israel (and had the gift, the amazing techonocolored dreamcoat, to prove it; Gen. 37:3), was prophesied to rule over them and even his father despite his low rank in the birth order (vv. 7-8), and because he gave a bad report about them (v. 2). Why did Israel’s 1st Century leaders hate Yeshua? Because He was the favored Son of God and Israel (and had the gifts to prove it, arousing their envy), because He was prophesied to rule over them—and even His father David (Psa. 110:1, Mat. 22:42ff)—and they didn’t think this hick from Galilee had the right (“Search, and see that no prophet arises out of Galilee” [John 7:52]), and because instead of siding with them, He brought a bad report, exposing their hidden sins (Mat. 5-7 and 23). When Joseph went to look into his brothers and found them goofing off yet again (hanging out in Dothan instead of tending the flocks), that’s when they decided to do away with him (Gen. 37:13ff). It was when Yeshua cleared out the Temple courts the second time that the plans to get rid of Him kicked into high gear (Mat. 21:12ff, cf. John 2:13ff). Judah was the one who got the bright idea to sell Joseph (Gen. 37:28). Judah/Judas was the one who sold Yeshua, and Judah/Judea handed Him over to the Gentiles (Mat. 26:15). Both were stripped of their clothes (Gen. 37:23, John 19:24). Rabbinic tradition has it that Joseph kept his brothers in prison for three days because he was kept in the cistern for three days (based on Gen. 42:17). It’s interesting that there’s a whole theme in Scripture of life from death being granted on the third day (the third day of creation, the Akkedat Yitzchak, Jonah, Esther, etc.). Joseph was falsely accused before Potiphar, the official representative of the then-ruling empire (Gen. 39:13ff). Potiphar essentially washed his hands of someone that he knew to be innocent to save his own honor. Yeshua was falsely accused before Caesar’s representative Pilate, who also washed his hands of an innocent man (Mat. 26:60). Both were mourned by Israel (Gen. 37:33f, Luke 23:55). Through his trust and obedience even in the midst of unjust shame and suffering, as well as through his wisdom and gifting to correctly interpret prophecy, Joseph was raised to the right hand of Pharaoh (Gen. 41:39). 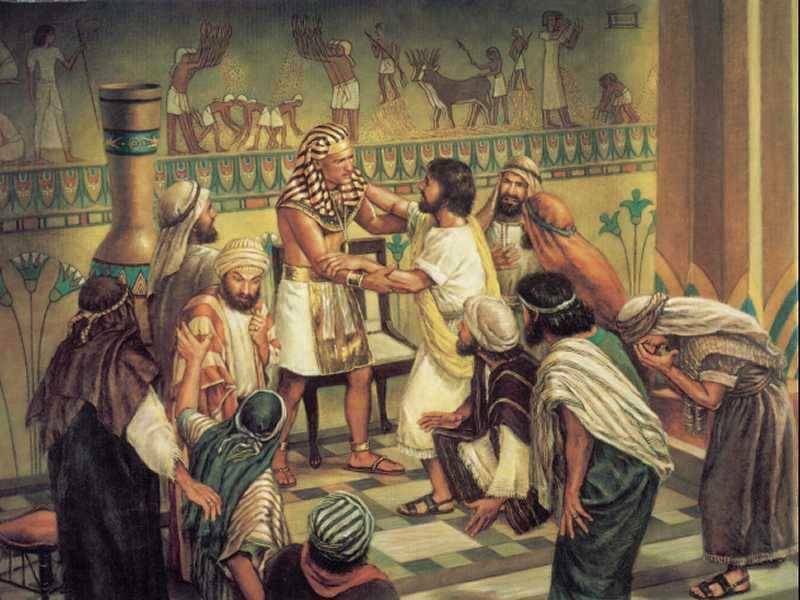 He was given all of Pharaoh’s authority–only in regards to the throne itself was Pharaoh Joseph’s superior. Through His trust and obedience even in the midst of unjust shame and suffering, as well as through his wisdom and gifting to correctly interpret all Scripture, Yeshua was raised to the right hand of God (Mark 16:19). All judgment is given to the Son (John 5:22, 27), yet the Father is still the Father. Through his wisdom, Joseph fed the entire Gentile world bread in the midst of a great famine (Gen. 41:57). Through His wisdom, Yeshua feeds the entire Gentile world the Bread of Life (Mark 6:44, John 6:33ff), which is the Word of God (cf. Deu. 8:3, Psa. 119:103, Eze. 3:3, Amos 8:11, Mat. 16:12 and 26:26). Joseph gave to all who came to him, accepting their goods, livestock, lands, and finally their very lives in return for food–and everything they gave him he made them stewards over for Pharaoh. Yeshua gives His Bread to all who come unto Him, gradually accepting our goods, livestock, lands, and finally our very lives–and everything we give unto Him He makes us stewards over for the King of Eternity. Joseph fed the entire Gentile world the Bread of Life (so to speak) before his brothers came to him. This is the first prophecy of Gentile inclusion in God’s Kingdom, corresponding with other prophecies that first the Gentiles would come to the Root of Jesse and be called by the Holy Name, and only after that would Israel be restored (cf. Isa. 11:10ff, Amos 9:11f). When Joseph’s brothers come to buy bread, they don’t recognize him (Gen. 42:7)! Why not? Because he was dressed in Egyptians clothes, with his head and beard shaved in Egyptian fashion, and speaking to them in Egyptian through an interpreter. Why haven’t Yeshua’s brothers recognized Him for two millennia? Once again, because we have dressed Him up as a Gentile, given Him a Gentile haircut, and He speaks to His brothers in Gentile language (Greek). Look through the whole corpus of Christian art and try to find a portrait of Yeshua that shows Him with a long, uncut beard, a head covering of some sort, tefillin (phylacteries), or tzitzit (tassels) on His cloak. Only a few old Eastern Orthodox works get it right. More to the point, look at how most Christian commentators exaggerate to cartoonish proportions the differences between Yeshua and the rabbis, never noticing the similarities in teaching, teaching styles (e.g., parables), gathering disciples, emotional makeup (Yeshua was clearly no stoic), etc. Small wonder His brother’s can’t recognize Him! When Joseph is faced with his brothers, he falsely accuses them, throws them into prison, and binds Simeon before their eyes and takes him away, requiring that they bring him Benjamin if they wish to see his face again (Gen. 42:9ff). In the same way, the Church has in Jesus’ name falsely accused the Jews, thrown them into prison, and taken away from the Jewish people, binding Jews who wished to follow the King of the Jews from being among their brothers. (See here for some examples.) Sadly, the Church went even further: Joseph never tortured or slew any of his brothers, but the Church has done so to the brothers of Yeshua! But notice here that even in testing his brothers with persecution, Joseph still gives them the Bread of Life they need to live. In fact, he does so freely, giving back the silver that they try to pay him with. Why? Because his brothers already belong to him, whether they know it or not. Is Yeshua less generous than Joseph? And if He is as generous, in what sense has He fed the Jewish people who didn’t recognize Him? Also let us note that Joseph seats his brothers in birth order to show that he knows them, much to their amazement and consternation (Gen. 43:33). Today in Judaism, there are increasing numbers of scholars who are studying the NT and discovering how well Yeshua knows them. Indeed, He is increasingly becoming known as a Jew of the Jews and a rabbi ahead of His time. It’s not where my people need to be, but the momentum is clearly in the right direction. I propose that Benjamin represents the remnant of Jewish believers, Messianic Jews if you will, that Paul assures us the Eternal One always reserves for Himself in Romans 11. Like Benjamin, the faithful remnant were born at the time of the death of their mother, Jerusalem (which dwells in Benjamin’s territory). We are the sons of sorrow and the sons of the Right Hand, Yeshua Himself. Like Benjamin, the remnant has always loved Yeshua and vice-versa. Like Benjamin, the remnant has virtually disappeared from the narrative of history, being mentioned only by our enemies when they try to suppress us. Like Benjamin, Israel has not allowed us to be seen among our brothers, and for the same reason: Fear that like Simeon, we will be carried away by the Gentiles, assimilated and lost to a Christian culture. And like Benjamin, we are ultimately “outed” by the discovery of our Lord’s Cup in our hands. Benjamin receives five times as much food as his brothers (Gen. 43:44). We have already established that food, bread in particular, is a type of the life-giving sustenance of the Word of God. It’s interesting that in Israel, it is becoming well known that the Messianics are ardent students of the Scriptures. In fact, if you want to know if you are talking to a Messianic, there is a simple test: Ask a question about the Law. A traditional Jew will answer from his rabbi or the Talmud; a Messianic will answer from the Scriptures, as our Great Rabbi has taught us. Notice also that only when Benjamin is among his brothers is Simeon returned to them. Simeon, we believe, represents those Jews who were converted to Christianity, bound by law in front of their brethren to no longer live as Jews, and taken away. 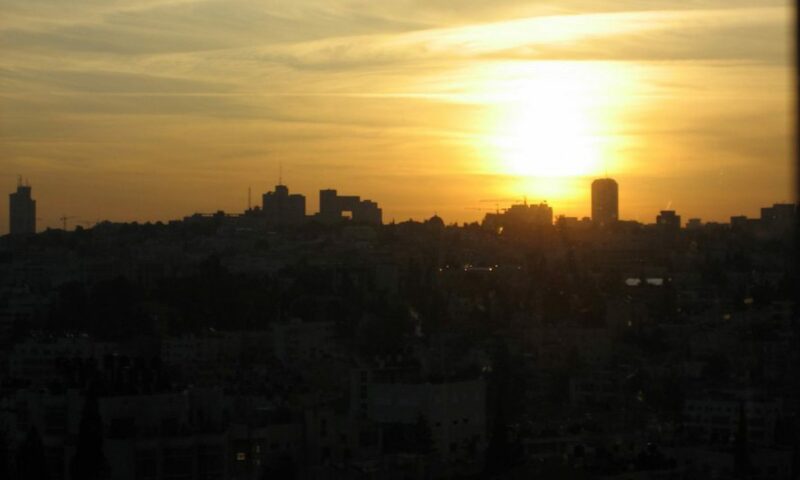 With the advent of Messianic Judaism, many in the world have become aware that they are descended from Jewish converts to Christianity, and are seeking to know what that means as far as their personal identity goes. Many are even returning to Judaism, both Messianic and traditional, to return to their roots. When Benjamin is caught with Joseph’s cup, the brothers face a decision-point: Do they let him be carried away by the Gentiles as Simeon was, or do they protect him as a brother at their own risk. Today, as more and more Jews declare themselves for Yeshua, Judah/Judaism faces the same decision: Do they reject the Messianics and force them out of the community to be assimilated by Gentile Christianity, or do they embrace us as brothers, even at the risk that they believe such inclusion could bring to Judaism? When Judah embraced and protected Benjamin as his brother, Joseph revealed himself at last for who he is. Likewise, as we see Judah embracing Messianic Jews, we see another sign that our Lord is soon to return. The more I study the Torah, the more I see the truth of what the Midrash Rabbah says of it: “What the prophets were destined to prophesy in subsequent generations they received from Mount Sinai. . . Moses gave utterance to all the words of the other prophets as well as his own, and whoever prophesied only gave expression to the essence of Moses’ prophecy” (Exo.R. 28:6, 42:8). Toda raba for posting this here! Now, I have a permanent link to it instead of a temporary link. My focus this year is on finding Messiah in the Torah/Tanakh. This article is very helpful and I will be reading the other two you linked to. If you can point me to any other information on this subject, I would be very grateful!